"Umi no Aria" bunko edition published by Shougakkan is in print. Abel, Collin, Juri and Ran meet a storm in the sea near Kamakura when they are sailing. Abel falls into the water and gets missing. Others see a fireball above the water. Collin and Abel are twin brothers whose mother is American. Juri and Ran are classmates in high school. Marisa, a singer, discovers a boy with blue green eyes in Okinawa. Though she makes a call to Mr. Otowa, who is Abel's father, he wouldn't take it serious and he gets upset since Abel's funeral is being held at the moment. Ran's elder brother sees Abel in Okinawa and makes a call to Ran. Collin, Juri and Ran go to Okinawa to see him. To their astonishment, Abel can't recognize them and can play the piano very beautifully. They doubt he is Abel. Collin has a mixed feeling since Abel was always superior to him and Collin was jealous of him. Ran says Abel knew he was good-looking and he was always making a move on girls who had a boyfriend. There are quite a few boys who got angry at him and Ran was one of them because Abel invited his girlfriend Hina to go on a date. Collin and Juri hear from Marisa that the boy knew of the telephone number of Mr. Otowa, they get sure the boy is Abel. Though Collin says to Abel, "I'm Collin, can't you recognize me?" Abel is speechless. He's lost his memory. Marisa has a polyp in her throat. She doesn't want to have an operation to remove it because it will unable her to sing anymore. She coughs with blood when she is talking with her ex-boyfriend. She runs away to Abel. When Abel is holding her neck, her ex-boyfriend misunderstands he is strangling her. He strangles Abel. Abel makes a scream and runs away from him into the water. In the hospital, a doctor says Marisa's polyp has disappeared. 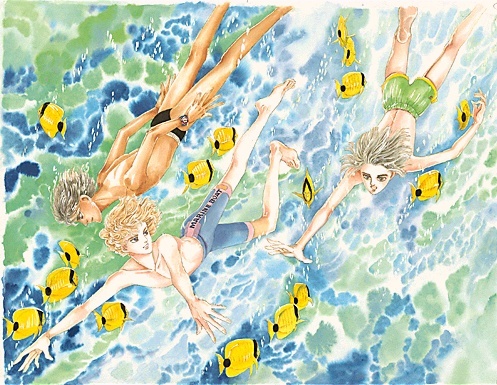 When Collin, Juri and Ran are looking at dolphins in the sea, they find Abel on a dolphin. Abel comes close to Collin and calls him Collin. Collin takes him home. Abel has lost all the memories that are necessary for getting along in the society. Mr. Otowa finds it irritating. Collin has to teach him everything and look after him. Mrs. Otowa is used to taking care of a kid because Collin got diseases when he was very young. She thinks Abel is in the same situation as she was in 20 years ago, when she came to Japan for the first time. Everything was new to her. Abel invites Collin to leave the house. Abel: I hate Mr. Otowa's shouting at me. Collin: He is our father. This house is our home. They are our parents. We're their children. Abel: Parents? Children? What are they? Collin: Mother gave birth to us. Abel: Eeeee? Did we grow out of her body? Then did Mr. Otowa grow out of her, too? Collin: No. Why do you understand I'm your brother? Abel: Because your body has the same structure as mine. We have the same genes. Collin: We were given the genes by Father and Mother. Abel: I understand. Mr. Otowa wants us to pay him dividends for the genes. That's why he shouts at me. On the first day Abel goes to school after the accident, he comes back home to sleep. Mr. Otowa gets very upset about that. Abel says he can't satisfy Mr. Otowa, so Mr. Otowa should give birth to a baby who he can expect to satisfy his desire. Abel: Mother gave birth to us, whereas Father's never given birth to anyone. Collin: Abel, Father is a man. He can't give birth to a baby. Abel: Why? Does his body have any problem? Father: Are you making fun of me? Abel thinks it unfair that only women can give birth to babies. Collin tells him men get married to women and give them genes and women give birth to babies. Abel asks if Hina will give birth to his baby when he gets marred to her. Collin says Hina is Ran's girlfriend and Abel can't get married until he becomes an adult. Abel doesn't know what "adult" means, but he understands Collin means the reproduction season hasn't come yet. Collin asks Abel if he is in love with Hina. Abel says he's not very sure. Collin thinks he loves Hina since he remembers her name. In midnight, Abel wakes up Collin and asks him if he called Abel. Collin says Abel must have had a dream. Abel looks at the sky and says someone is calling him. When Juri tries to take Abel to the infirmary, Abel goes to the top of the school building. Abel can hear someone call him. Teachers are surprised to see him standing at the dangerous place. Collin asks teachers not to notify the incident to their parents. Seeing Hina talking with Abel, Ran threatens Abel. Abel hits Ran and runs away. They find him at the seaside. Abel is going into the sea. A man in black stops him to go any further. Abel says, "I prefer staying in the water." The man in black says, "You can't live in the water since humans live on the land." The man swiftly goes away, but Abel is sure he is the one who's been calling him. The man in black is a new music teacher, whose name is Ariad. His playing the piano shakes Abel's body and Abel makes a scream and a clock falls off the wall. Ariad tells the students they should call it a day and tells Abel that they have to talk. Collin asks him if they should pay for repairing the clock. Abel says it's Ariad to blame and tells Collin to leave Abel and Ariad alone. Ariad says Abel is actually not Abel but a Berinmon. Abel decides to behave more Abel-like than before. He comes to behave properly. In October, Collin sees Abel extorting money from a student. Collin criticizes Abel for doing that and gives the money back to the student. Seeing Abel's deposit book, Collin is surprised to know Abel has nearly 100,000 yen in the bank. Abel says he's found the deposit book and a notebook in his desk. Abel collected money following the notebook, as he had done before he lost his memory. Abel says the student who he extorted money from was caught at getting out of a brothel, and another student was caught at shoplifting by him. Ariad appears suddenly and says Abel was too complicated for someone else to take over. He says, "Wake up, Berinmon." Abel shows Collin a model gun that he's discovered in his desk. Collin shows Abel's notebook to Juri and asks him why he thinks there are the name of Hina and the dates when Abel went to the infirmary in the notebook. Abel has no detailed memories. Juri has no idea. Hina says Abel didn't extort money from her. On the day before an exam, she saw him get out of the infirmary crying. On the same day, he told her he had a toothache and not to tell anyone he was crying. After the exam, he gave her a call and asked her to meet him at the Kamakura station. He took her to Enoshima and asked her how she thought of him. He said he'd liked her since she'd transferred to the school. She said she wanted to go home. Abel said he would dive into the water to kill himself if she went home. Abel said he wanted to annoy a person like Hina, who lived happily with a cool boyfriend. Hina said Abel also must have been happy. He said his life almost had ended and he wanted to die. "Why don't you die?" said Hina. Abel smiled. When Abel got missing in the sea, Hina regretted a lot she had said that. She regretted she hadn't asked him what he was suffering from. She is very happy Abel got back. Collin asks Abel if he's been suffering from something. Abel has no idea. When Sekine, who takes care of students at the infirmary, greets Abel, Abel runs away. When Juri and Ran visit Collin to talk about the exam and the reeducation of Abel, Abel says, "I'm killing you." holding a model gun. Abel is going out. Ran asks him who he is killing. "Sekine" says Abel. They chase Abel to the school. When they are about to go to the infirmary, Ariad join them. Ariad tell them not to call Abel at the moment because he deeply gets into Abel's mind. Sekine sees Abel and says, "Otowa-kun, do you have a headache again? Please come in. I'll give you a pain-killer." Abel gets into the infirmary through the window breaking the window pane. He repeatedly say, "I'm killing you." "Why are you killing him?" asks Ariad. Abel: He knew I'd been exhausted. Sekine: I gave you a medicine since you said you had a headache. You appreciated that. Abel: You touched my body. I didn't want to go to the infirmary. But I had a headache before an exam. If I wasn't able to prepare for the exam, my father would be disappointed with me and he would abandon me as he abandoned Collin. So I went to the infirmary. Sekine told me to take off the jacket in January, the shirt in February. He ended up telling me to be all naked. Sekine: I just touched to examine. I just wanted to see the skin of a young man. You appreciated I gave you a medicine. Abel: I want to die. Everyone will know what I am. I take off the clothes and allow Sekine to touch me to get a medicine. I want nobody to know it. Collin yells, "Stop, Abel." Abel shoots Sekine. Suddenly, Collin gets into the stormy day when Abel got missing and he sees the fireball going close to Abel and it gets into him. He shouts, "Help Abel!" Everyone comes back to the reality. The windowpane isn't broken. Ariad gets out of the infirmary holding Abel. Ariad says they saw the illusion that Berinmon made. He says the fireball that they saw above the sea on the stormy day and got into Abel was a soliton in a Berin crystal. It was floating after the Berin crystal which it had been in was destroyed, and it happened to discover the dead body of Abel and got into it. Ariad had been searching for Berinmon that had escaped from him. " I own it. It resonates to me." says Ariad. Collin wouldn't believe him. Ariad says "After getting into Abel, Berinmon reads his memory and pretends to be Abel. "Abel's not dead. Give back Abel." says Collin. "It's my Berinmon." says Ariad. Abel: I was scared. It was beyond control. Did Sekine die? Collin: No, he didn't. The gun was a toy. Abel: When I held the gun, Abel's anger exploded suddenly in me. Ariad: It's very scary to become a human, isn't it, Berinmon? Collin: There's nothing scary any more. Abel's stress has all come out. Ariad: I'm a perfomer of the feeling play. Berinmon is my musical instrument. Ariad says Abel can stay with the Otowas until he gets bored to be a human and recalls Ariad and his mission. Ran says to Abel, "You're an alien in disguise." Collin tells Ran to stop saying that. Ran says something must have happened to Abel since he's come to be able to play the piano and he was found in Okinawa. Juri says Abel is not what he was. Collin also thinks there's an Abel who he's never known, who was suffering, who extorted money from students and wanted to die. In a music room, Ariad tells Abel about Berinmon. He shows an illusion of a Berin crystal, which a soliton lives in. A Berin crystal develops in the star of Berin. It makes a sound. It's very hard for a performer to find a Berin crystal that is resonant to him or her. If a performer finds a Berin crystal that is resonant to him or her, the Berin crystal will make a miraculously superb musical instrument that perfectly reflects the performer's feelings. There are many performers who want to go to Berin to find one, but only a limited number of them are allowed to get into Berin and they can stay there only for a year. Ariad was lucky enough to find one two days before he left Berin. The Berin crystal made a sound and even some melody resonant to his telepathy. "You sang, Berinmon. You must have heard me call you whenever I called you." says Ariad to Abel. Abel asks why Ariad came to the Earth. Ariad left Berin with the Berinmon for home and came to the Earth to take a rest since the Earth is similar to his home star. Ariad was hit with a thunderbolt in a mountain. Abel begins to shudder to hear that. The chairs in the room move up and down. Ariad says Abel must remember being hit by the thunderbolt and he moved the chairs with a special power that Abel potentially had. When the thunderbolt hit Ariad, he saw Berinmon get out of his bag. He opened the bag and found the Berin crystal broken in pieces. A Berinmon dies 30 hours after it loses the Berin crystal. Ariad's Berinmon found Abel's dead body 20 hours after it had lost the Berin crystal, and it got into Abel's body. Abel says he has no intention of singing as Ariad's musical instrument. Ariad says if they become a leading feeling player and his instrument, they will be able to conquer the universe. "Sounds great." says Abel. He says, "If a Berinmon is so powerful, I'll conquer the Earth first." Niki comes to the Earth and enrolls into the same school as Abel to investigate about a Berinmon that was stolen from Berin. He asks Ariad how the Berinmon has come to be. Ariad says the Berin crystal had been broken and the Berinmon is now in Abel. Niki says if Ariad proves that he can play the Berinmon, the Berinmon belongs to him and he is not guilty. Ariad tries to prove that in the music room. "You're a kidnapper!" says Abel. When Ariad found the Berin crystal, there were only two days left before he should leave Berin. The Berinmon didn't resonate to him before other performers and scholars and he failed to prove it was resonant to him. However, Ariad wasn't able to give up having the Berinmon and he left Berin with it without permission. He actually sought shelter on the Earth. Ariad shows Abel an illusion trying to prove Abel is resonant to him. Abel tries not to react to it since he wants to stay being Abel, a human. Ariad fails to prove that there's a Berinmon resonant to him in Abel. Niki gives Ariad just one more day to prove it Arial asks Abel to go to Okuchichibu, where they were hit by a thunderbolt. Abel refuses to go there. Ariad kidnaps Hina and tells Abel to go to Okuchichbu, where he takes Hina into his spaceship. Abel, Collin and Ran go to Okuchichibu with Niki to rescue Hina. Niki shoots Ariad. Seeing Ariad's dead body, Abel gets unable to control himself. Someone in him orders him to burn Niki, who's killed Ariad. Though Niki tells him to stop, Abel can't think of anything. "Stop that, Abel." says Ariad. Abel realizes he was tricked by Ariad and Niki. Ariad's dead body that Abel saw was an illusion that Niki showed. "I've proved it successfully." says Ariad. Even though Abel says, "I'm not so sure" , he can't help crying. "Abel, I've got you, my best musical instrument." says Ariad. Ariad sends them back to Zushi in his spaceship. On the beach in Zushi, Abel makes apologies to Collin, Ran and Hina. When Abel gives Hina a kiss, Ran gets upset since he's never kissed Hina. Ran and Hina end up kissing each other for the first time, and Abel tells Collin Ran should be grateful to Abel. Ran is surprised to see Abel in the classroom. Abel is still on the Earth because music committee members will be coming to listen to Ariad's performance. Ran: Give the kiss back. In Abel's dream, someone is weeping. In the morning, Abel opens the curtain and he sees a big starfish outside the window. Two of committee members, Popol and Potos arrive. One more committee member is arriving shortly. Abel sees a girl sailing. She is Lilid. Abel sees a silver harp in her room. Lilid says it's her late brother's. Abel wonders if it was her that was weeping in his dream. Lilid enrolls to the high school which Abel attends. She asks Abel if Ariad is in the school. Abel thinks she could be the committee member who they have been waiting for, but she isn't. Though she says to Ariad that her elder brother, Daridan, was in the same music college as Ariad, Ariad doesn't remember Daridan. Lilid wants to see the Berinmon that she's heard he got. Ariad tells her Abel is the Berinmon. Lilid says she doubts Ariad can perform a music that moves people. She says Ariad can only make a nightmare. Ariad wonders what she is. Popol and Potos say "Daridan is dead." Another committee member, Titi, has just arrived. Abel asks them when, where and how Daridan died. Ariad says he doesn't remember Daridan and he finds Lilid offensive. He just wants to think only about performance and he wants Abel to be obedient to him because Abel is his musical instrument. Abel says he knows he's not Ariad's friend. He says Lilid said the society which Ariad was raised in didn't have the word for "friend". Abel asks Lilid why she is so upset about Ariad. She says Ariad and Daridan went to the planet called Nightmare together and only Ariad came back. She can't believe Daridan drowned in the sea since everyone in her star is a good swimmer. The college isolated Ariad in the hospital for two years after he had come back from Nightmare. Ariad and Daridan were rivals. Lilid thinks Ariad abandoned Daridan in the accident. She says Ariad had no friends whereas everyone loved Daridan. She wouldn't allow him to forget the death of Daridan and become a performer. Abel wonders why Ariad doesn't remember Daridan. Ariad says he was isolated for two years because he got influenza. He says he's never been to Nightmare. Ariad says he can't keep anything secret to Abel as long as they resonate each other. The committee members arrive to listen to Ariad's performance. When Ariad begins to play, Abel hears echoes inside the ears and all bones vibrate to sing. Waves come and go in his body. Suddenly he senses something that prevents the music waves from going smoothly. Even though the committee members are satisfied with his performance, Ariad says he can't play very well. It occurred to Abel that Lilid is right. He thinks Ariad is hiding something behind the door that stands in the sea of the music. "We'd better look behind the door." says Abel. Abel wants to talk about Nightmare. He wants to know why Ariad's forgotten about it if he has. Ariad criticizes Abel for believing what Lilid said despite that Ariad is Abel's owner. Abel says he wants an equal partnership with him. After eating curry rice, Abel is hit by a glass of water. He realizes it's a memory of Nightmare. Though he asks the committee members about the issue of Daridan, most details are confidential and they can't tell him. They say Daridan's silver harp was missing with him. Lilid says the silver harp that she has is a replica. She's known the issue is confidential. She got to know Ariad had gone to Nightmare with Daridan from hologram letters from her cousin Saro, who attended the same college. Saro said Daridan had said he was going to Nightmare with Ariad. However, after Daridan died, it was said that Ariad had got influenza and had been isolated before going to Nightmare. In another letter, Saro said she had met Ariad in the hospital and he had not remembered Daridan at all. Abel asks Niki to find more details about Daridan's death. Niki searches for records of the Planet Research team. Lilid has known that 12 of the team members went to Nightmare five years ago. In the record of the team, there's a line saying "Daridan is missing", and the next line is deleted. The deleted line must refer to Ariad. Abel gets sure the college deleted Ariad's memory as they deleted the line. Niki wonders why the college did that and he contacts Dr. Dacca Dacca, who was a team member and is interested in music. His hologram image appears. Dr. Dacca Dacca says he will help them out if they give him two tickets of the Berinmon's concert. Abel says he wants to know what happened on Nightmare five years ago. "Is your player Ariad? Is he alive?" asks Dr. Dacca Dacca. He met Daridan and Ariad on Nightmare. The Planet Research team asked them to come there. They expected them to find the direction of the evolution using the players' sense for the life rhythm. When they were on the seashore, a big wave of red starfish came and swallowed them. Daridan got missing and Ariad was found half eaten on a rock. Neither of them wore a protective gear. Lilid learns it wasn't Ariad's fault that Daridan was missing. Abel visits Ariad and tells him Ariad should recall what happened in Nightmare since Abel dreams of Nightmare instead of him. On his way home, Abel meets Popol and Potos. They ask him to ask Lilid to lend them the silver harp to unseal the secret of Ariad. Popol and Potos say Ariad's injury got worse repeatedly even though it was cured many times. The hospital had no other choice than sealing his memory about Nightmare. Popol and Potos suddenly tie up Abel and throw him into the sea with the silver harp saying, "The music will unseal the secret. We don't want him to do it." Lilid makes a call to Ariad to get help. Abel unties the rope in the water. He feels great there and wants someone to stop calling him. When Lilid and Ariad arrive at the seashore, Ariad feels scared of the sea. Abel gets out of the water with the harp. Ariad's touching the harp makes a sound and the sound reminds Ariad of Daridan and starfish. Ariad runs away. Popol, Potos and Titi arrive at the seashore. They say, "It's begun." Titi tells Abel and Lilid not to run away. She says Ariad's memory has been unsealed and the whole town is being packed with his illusion and they are now in Ariad's dream. Popol and Potos say they threw Abel into the sea to give Ariad a shock to unseal his memory. They expect Abel, Ariad's musical instrument, to restore order in Ariad's mind. They tell Abel to find Daridan in Ariad's dream. Abel and Lilid see Daridan on the street. He says "Our promise hasn't been executed yet." Dr. Dacca Dacca appears and says they made a promise and that Ariad didn't want to execute it even though Daridan relentlessly asked him to execute the promise.. A woman appears and says, "I'm scared of him. He asked me to bury the dead body of his grandfather under an orange tree even though his grandfather was still alive. He said his aunt wouldn't come to the new year party. His aunt died on the day before the new year." They see the students in the college. Daridan is walking with his friends. Ariad is walking alone. Ariad says to a professor that he doesn't want to go to Nightmare with Daridan. Ariad ends up leaving for Nightmare with Daridan. Daridan says he's never hated by anyone like that and he is puzzled. Abel and Lilid arrive at Ariad's house. Abel asks him if he can foretell when someone dies and if he knew Daridan would die in Nightmare. Daridan appears outside the window and says "Execute the promise, Ariad!" He breaks the windowpane. The house gets broken. Abel and Lilid fly with a door to find Ariad. They find him in a temple. Abel tells him to execute the promise. Ariad doen't remember the promise. Daridan appears. . Ariad and Daridan talk on Nightmare. They have different opinions on the evolution of Nightmare. Ariad says he can see into the future. Daridan asks him what he has foreseen. Ariad answers he has foreseen the deaths of his relatives. Daridan asks if he can see into Daridan's future. He asks if he'll become a top performer. "You're going to die in Nightmare." says Ariad. That's why he didn't want to go to Nightmare with him. Lilid asks him why he told it to Daridan. Ariad says it was too hard for him not to tell and that once he told it there was something harder. Ariad says to Daridan what he said was just a joke. Daridan tells him not to lie to him. Daridan says he doesn't feel scared and asks Ariad to sing a requiem for him if he dies earlier than Ariad. He says he will sing a requiem for Ariad if Ariad dies earlier than he. Ariad wouldn't make a promise since he thinks he might be able to change what he foresees. "You weren't able to change the future, Ariad." says Abel putting his hand on Ariad's shoulder. Ariad holds the hand. A requiem begins. Lilid thinks the music sounds as if it came from the sea on Nightmare where Daridan is sleeping. She's sure Nightmare also loved Daridan. It's the very music that she has wanted to listen to. Abel goes to the infirmary to sleep. He's learned that singing is energy-consuming. Lilid appreciates he sang for Daridan. Abel says she should appreciate Ariad's performance. Lilid says she does but she knows it wouldn't have happened without Abel. She says she doesn't feel lonely now since Daridan has come back with the requiem. The committee members say Ariad and Abel have passed the exam. Ariad is happy to hear that but at the same time he is thinking about many things now that he got to know what kind of person he is. Abel thinks Ariad needs him.